____Can you view raw footage on a monitor? 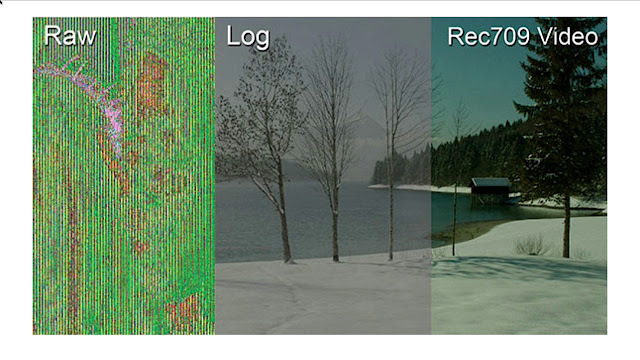 What's baked into the image by Log recording? What's the advantage of having uncompressed footage vs compressed footage? With more and more cameras offering a variety of outputs and formats, it's easy to lose track of just what you're getting with each option and what they ultimately mean for the final image. Well, lucky for us, there are folks like Andy Shipsides at AbelCine looking to clarify and explain the differences, as he does in this very informative breakdown for HDVideoPro. ____Raw is not Log because Log is in a video format, and raw is not video. Raw data has no video processing baked in and has to be converted into video for viewing. Log is video and has things like white balance baked into it. They're very much not the same; however, they're both designed to get the most information out of the sensor. Raw is getting everything the sensor has to offer; likewise, Log curves are designed to get the most tonal range out of the sensor. While they're very different formats, they have the same general application. Both raw and Log can be uncompressed, but that depends on the recording device. These terms, and many others, have all become part of our vocabulary in this digital cinema world. ____For the full breakdown, check out the article here, it really is a must read for folks wanting to get an informative and concise answer to these questions. As these options become more accessible, it will be interesting to see just what impact they'll have on people's creative process, or whether folks will opt for the immediate gratification of built-in looks. Do you think these options are must-haves? If you've recorded in Log or worked with a raw workflow, what impact have they had on your shooting? Let us know!